Objective: The predictive value of electrophysiologic visual testing in Creutzfeldt-Jakob disease (CJD) was investigated, and the retinal pathologic findings in three cases are reported. Background: The fatal prognosis of CJD, its transmissibility, and the lack of treatment make early diagnosis essential in averting human-to-human transmission. Electroretinogram and visual evoked potentials have been studied in few cases of CJD. Methods: A visual electrophysiologic examination was performed in 41 consecutive patients referred with suspected CJD. The disease had been diagnosed in 24 patients (CJD group; 15 were confirmed neuropathologically and 9 by clinicolaboratory methods in accordance with diagnostic criteria). The remaining 17 patients were diagnosed with other neurologic disorders, and served as a control group. Results: Flash electroretinogram revealed a significant decrease in the amplitude of the B1 wave (<60 µV) and the B/A ratio (<2) in the CJD group compared with those in the control group. Flash visual evoked potentials revealed no significant difference in latency, but amplitude was increased (>10 µV) in the CJD group, especially in patients with myoclonus. Conclusions: The visual electrophysiologic abnormalities provide an interesting noninvasive diagnostic tool in idiopathic CJD. The B1-wave decrease is closely correlated with the outer plexiform layer abnormalities observed on neuropathologic examination. Creutzfeldt-Jakob disease (CJD), a rare spongiform encephalopathy related to prions, may be idiopathic (sporadic), familial, or iatrogenic (following treatment with human growth hormone [HGH],1 corneal transplantation,2 or dura mater graft3). The fatal prognosis of the disease, its transmissibility, and lack of treatment make an early diagnosis essential in averting human-to-human transmission. A neuropathologic examination is, however, required for a definite diagnosis of CJD. Before pathologic (e.g., biopsy) results, a diagnosis of probable CJD can be supported by clinical and laboratory criteria.4 Renault et al.5 reported early changes in the B1-wave electroretinogram (ERG) in two patients with HGH-linked CJD, and suggested early impairment of the retinal function. The aim of this study was to evaluate the predictive value of flash-elicited ERG and flash visual evoked potentials (VEP) in idiopathic and iatrogenic CJD, and report retinal pathologic findings in three cases. Methods. Patients. Between 1992 and 1997, 47 patients (17 women and 30 men) with suspected CJD referred for neuro-ophthalmologic evaluation were observed. Six patients with a mean age of 28 years (range, 21 to 45 years) were suspected of having iatrogenic CJD (five post-HGH, one after dura mater graft following neurosurgery). The remaining 41 (15 women and 26 men) presented with a rapidly progressive cognitive impairment and were suspected of having idiopathic (sporadic) CJD (mean age, 66 years; range, 44 to 81 years). Definite CJD: Neuropathologically confirmed spongiform encephalopathy in a case of progressive dementia with at least one of the following features: myoclonus; pyramidal, cerebellar, or extrapyramidal signs; or characteristic electroencephalography (EEG). Probable CJD: Neuropathologically unconfirmed cases with rapidly progressive dementia and myoclonus, and at least one of the following laboratory abnormalities: EEG with typical periodic sharp wave complexes, level of neuron-specific enolase (NSE)6 higher than 25 ng/mL, and detection of 14-3-3 protein7 in the CSF or mutations in the prion protein (PrP) gene.8,9 Patients with neuropathologically unconfirmed rapidly progressive dementia and myoclonus who had received HGH were also considered as probable cases of CJD. Other diagnoses: Patients with a disease course of more than 3 years and those with evidence of another disease (paraneoplastic syndrome) or neurologic improvement were regarded as the control group. Following application of the aforementioned criteria, 15 patients were diagnosed with definite (i.e., neuropathologically confirmed) CJD; 9 with probable (i.e., clinicolaboratory definite) CJD; and 17 with other neurologic disorders. The 24 CJD patients who were subsequently included in the French BioMed CJD surveillance registry10 were considered the CJD group. The remaining 17 patients served as a control group. Clinical findings. Of the 24 cases, 4 were iatrogenic (post-HGH) CJD, and the other 20 were idiopathic CJD. Tables listing neurologic signs detected at the initial ophthalmologic examination are available from the National Auxiliary Publications Service (NAPS; see Note at end of article). Visual disturbances were found in 11 patients: diplopia in 6, blurred vision in 4, supranuclear ophthalmoplegia in 3, and lateral homonymous hemianopia in 1. Mean disease course from estimated date of onset to death was 6.2 months (range, 3 to 10 months) in idiopathic CJD and 11 months (range, 8 to 17 months) in post-HGH CJD. No clinical difference was observed between patients in the definite and probable CJD subgroups. Laboratory findings. The EEG showed specific periodic sharp wave complexes in 14 of the 20 idiopathic CJD cases, and in only 1 of the 4 post-HGH CJD cases. CSF was studied in 23 patients. Protein and cell levels were normal. Increased CSF NSE concentrations and the presence of CSF 14-3-3 brain protein were observed in 5 tested patients. The results of codon 129 genotyping in 15 patients are available from NAPS (see Note at end of article). In these patients, tests performed to detect the presence of a PrP gene mutation were negative. Brain MRI or CT scan was performed in all patients and revealed cortical or cerebellar atrophy in 11 cases. Clinical and electrophysiologic visual examination. The ophthalmologic examination was done 1 to 10 months (mean, 3.3 months) after onset of the first signs. The anterior segments of the eyes were examined using a slit lamp (Haag Streit, Switzerland). Funduscopy was performed using an indirect ophthalmoscope (Heine, Herrsching, Germany) and an aspheric 20-diopter lens (Nikon, Japan). The visual acuity of 15 patients was measured with a test projector (Rodenstock, Ottobrunn, Germany). Monocular flash ERG was performed using a hand-held photodiode device (250 lux) with controlled illumination in photopic and scotopic conditions (Moniteur Ophtalmologique, Villeneuve d'Asq, France). Binocular VEP responses to flash stimulation (250 lux) at a rate of 1 Hz were recorded. The electrophysiologic results were compared with those of age-matched normal subjects (ERG: B1-wave amplitude >60 µV, B/A-wave ratio >2; VEP: latency wave <132 milliseconds, amplitude <10 µV). Two patients had two consecutive ERGs performed 1 and 3 months after onset. Neuropathologic examination of the retina. Neuropathologic examination of the retina was performed in three CJD patients postmortem. The eyes were immediately fixed in 2.5% glutaraldehyde, postfixed using 1% osmium, and embedded in Epon medium. Then 1-µm-thick sections were stained with methylene blue for light microscopy. Sections suitable for electron microscopy were stained with uranyl acetate and lead citrate. Statistical analysis. A statistical analysis was performed on sensitivity, specificity, positive and negative predictive value, diagnosis of retinal defects on ERG (B1-wave amplitude, B1/A-wave ratio), and optic nerve impairment (VEP-wave amplitude and latency). The CJD group (definite and probable CJD) was compared with the control group using a χ2 test at a significance of 95%. All p values less than 0.05 were regarded as statistically significant. Within the CJD group, separate comparisons were made between definite and probable CJD. Results. Electrophysiologic visual findings. Results of the slit-lamp and fundus examinations were unremarkable. Electrophysiologic visual findings are available from NAPS (see Note at end of article). Each patient had at least one electrophysiologic test (ERG or VEP). In a few patients, bad compliance related to poor general state prevented the use of one or the other of these tests. Nevertheless, ERG and VEP studies were performed in 31 of the 41 patients. An ERG was performed in 19 of the 24 CJD patients and in all control subjects. The B1-wave was found to be decreased in 17 CJD cases (figure 1). Figure 1. Photopic ERG recording in post-human growth hormone Creutzfeldt-Jakob disease (CJD) (upper) and idiopathic CJD (middle) patients and a control patient (lower). OD = right eye; OS = left eye; Pho = photopic; BI = binocular; VAL = valid; REJ = rejected. The two patients with normal ERG findings were tested 1 month after onset. Abnormal ERGs were found in only 4 of the 17 control patients. The B/A ratio was abnormal in 14 of the 19 CJD cases tested and in 3 of the 17 control subjects. In two CJD patients whose first ERG was abnormal, a second ERG recording was performed 3 months later. The results in those two patients showed a significant decrease in B1 wave (-50% and -20%, respectively) compared with A wave (-20% and -10%, respectively). The VEPs were studied in 20 of the 24 patients with CJD and 16 of the 17 control subjects. No recordable response was found in four patients with CJD. In five patients, P100-wave latency shift was observed. The VEP-wave amplitude was significantly increased (>10 µV) in 15 patients (figure 2), all of whom presented with myoclonus. Figure 2. The VEP recording (20 µV/division) in a Creutzfeldt-Jakob disease patient (upper) and control patient (10 µV/division) (lower). OD = right eye; VAL = valid; REJ = rejected. In the control group, there was no recordable VEP response in four cases, and P100-wave latency shift was observed in four cases. The VEP-wave amplitude was increased in two control patients, both of whom presented myoclonus. Statistical results are given in the table. Comparisons between CJD patients and control subjects produced similar results whether all CJD patients were considered together or the definite and probable CJD subgroups were considered separately. Compared with the control group, the CJD group showed significant differences for the following three parameters: ERG B1 wave smaller than 60 µV (p < 0.0005), ERG B/A-wave ratio smaller than 2 (p < 0.005), and VEP-wave amplitude larger than 10 µV (p < 0.0005). No significant differences were found in VEP latencies between the two groups. Pathologic findings within the retina. Despite neurosensorial retinal detachment from the pigment epithelium, the inner and outer photoreceptor segments were well preserved at the light microscopic level. In the outer plexiform layer, significant spongiform changes were identified (figure 3). The central part of the retina showed vacuolization, whereas true holes were observed in the peripheral part (figure 3A). In the three studied patients, vacuolization was more prominent in the peripheral than in the central part of the retina (figure 3, A-D). Spongiform areas were also observed in the inner plexiform and ganglion cell layers. A moderate degenerative loss of ganglion cells in the whole retina associated with a diffuse and less severe spongiosis was found, compared with that observed in the outer plexiform layer. Figure 3. Photomicrographs show the retina of three Creutzfeldt-Jakob disease patients. (A) Peripheral part of the first patient's retina shows clear holes in the outer plexiform layer involving the photoreceptor nuclei and the inner nuclear layer (magnification ×400 before 31.3% reduction). (B) Peripheral part of the second patient's retina. Note the diffuse spongiform degeneration, especially in the outer plexiform layer (magnification ×400 before 31.3% reduction). (C) Central part of the third patient's retina. The outer plexiform layer is clearly vacuolated, and the external limitans membrane is not involved. (D) Higher magnification of the third patient's retina (magnification ×1,000 before 31.3% reduction). The photoreceptors are replaced by spongiform Müller cells, and the remaining synapses are situated near the inner nuclear layer. (E) This picture confirms the vacuolization of the Müller cells, which are easily identified between the photoreceptor nuclei. They are electroluscent and swollen which is a rare finding. The photoreceptor synapses are picnotic, dense, and isolated or separated by spongiform Müller cells. Spongiform changes also involved the inner nuclear layer (magnification ×26,000 before 31.3% reduction). GGL = ganglion cell layer; IPL = inner plexiform layer; INL = inner nuclear layer; OPL = outer plexiform layer; ONL = outer nuclear layer; ELM = external limitans membrane; NFL = nerve fiber layer; S = photoreceptor synapses. The electron microscopic study (figure 3E) confirmed the existence of major changes in the outer layer, probably due to an increase in the cytoplasmic volume of Müller cells, which appeared swollen and electroluminescent. The photoreceptor synapses were particularly deteriorated: They were dense, picnotic, and separated by electroluminescent vacuoles made of swollen Müller cells. The zonulae adherens of the external membrana limitans were spared. Diffuse moderate spongiform changes were observed in the inner plexiform and ganglion nerve cell layers. There was a decrease in the number of ganglion cells without glial hypertrophy. Discussion. This study showed an early impairment of inner retinal layers, demonstrated by ERG findings and an increased VEP-wave amplitude in many cases of CJD. Findings in the CJD population sample were comparable with those previously reported in terms of age at onset, disease course, clinical ophthalmologic and neurologic signs, EEG findings, CSF, and cerebral imaging in both idiopathic11 and post-HGH CJD.1 Visual disorders reported in CJD patients have been regarded as nonspecific,12 especially in cases of mild neurologic deterioration. Thus, the ophthalmologic examination is often normal.12 The visual symptoms were related to supranuclear or internuclear oculomotor paresis, visual agnosia, palinopsia, hemianopsia, cortical blindness in the Heidenhain type, impaired convergence, or skew deviation.12-15 Nevertheless, the exact incidence of visual symptoms is unknown. Histologic retinal lesions have been described in experimental scrapie in mice or intraperitoneal CJD.17,18 These mice develop major retinal degeneration affecting the outer photoreceptor segment. This neuronal loss is correlated with Müller cell hypertrophy. In human CJD, retinal ganglion cells also are mildly degenerated.16,19,20 Histopathologic examination in three of the patients in this study revealed few changes in the outer and inner segments of the photoreceptor. Prominent spongiform changes or true holes were observed in the outer plexiform layer, and a moderate loss of ganglion cells was associated with a moderate spongiform aspect of the nerve fiber layer. These findings were closely correlated with the ERG B1-wave decrease and the relative preservation of the A wave. The peripheral areas were more involved than the central areas of the retina. The pathogenesis of these enhanced potentials remains controversial. Cortical hyperexcitability has been discussed as a possible mechanism.21 However, Fukui et al.23 showed that there is no interaction between periodic synchronous discharges and VEPs in CJD. It appears that periodic synchronous discharges are generated by neuronal structures different from those involved in VEP generation. Further studies are needed to attempt establishment of a relation among EEG, electromyogram recording in myoclonus, giant VEPs, and giant somatosensory evoked potentials. The final diagnosis must be based on neuropathologic examination, but VEP, and especially ERG, provide an important noninvasive antemortem diagnostic aid for iatrogenic and idiopathic CJD. The authors thank Dr. Catherine Masson (Hôpital Beaujon, Clichy) who followed up Patient 24 and provided the neuropathologic findings. Note. Readers can obtain 9 pages of supplementary material from the National Auxiliary Publications Service, 248 Hempstead Turnpike, West Hempstead, NY 11552. Request document no. 05465. Remit with your order, not under separate cover, in US funds only, $15.00 for photocopies or $5.00 for microfiche. Outside the United States and Canada, add postage of $4.50 for the first 20 pages and $1.00 for each 10 pages of material thereafter, or $1.75 for the first microfiche and $1.00 for each fiche thereafter. There is a $25.00 invoicing charge on all orders filled before payment. Received October 20, 1997. Accepted in final form June 18, 1998. Billette de Villemeur T, Deslys JP, Pradel A, et al. Creutzfeldt-Jakob disease from contaminated growth hormone extracts in France. Neurology 1996;47:690-695. Martinez-Lage JF, Poza M, Sola J, et al. Accidental transmission of Creutzfeldt-Jakob disease by cadaveric graft. J Neurol Neurosurg Psychiatry 1994;57:1091-1094. Duffy P, Wolf J, Collins G, DeVoe AG, Streeten B, Cowen D. Possible person-to-person transmission of Creutzfeldt-Jakob disease. N Engl J Med 1974;290:692-693. Kretzschmar HA, Ironside JW, DeArmond SJ, Tateishi J. Diagnostic criteria for sporadic Creutzfeldt-Jakob disease. Arch Neurol 1996;53:913-920. Renault F, Richard P. Early electroretinogram alterations in Creutzfeldt-Jakob disease after growth hormone treatment. Lancet 1991;338:191. Zerr I, Bodemer M, Otto M, et al. Diagnosis of Creutzfeldt-Jakob disease by two-dimensional gel electrophoresis of cerebrospinal fluid. Lancet 1996;348:846-849. Hsich G, Kenney K, Gibbs CJ, Lee KH, Harrington MG. The 14-3-3 brain protein in cerebrospinal fluid as a marker for transmissible spongiform encephalopathies. N Engl J Med 1996;335:924-930. Parchi P, Castellani R, Capellari S, et al. Molecular basis of phenotypic variability in sporadic Creutzfeldt-Jakob disease. Ann Neurol 1996;39:767-778. Ripoll L, Laplanche JL, Salzmann M, et al. A new point mutation in the prion protein gene at codon 210 in Creutzfeldt-Jakob disease. Neurology 1993;43:1934-1938. Brandel JP, Delasnerie-Laupretre N, Laplanche JL, Dormont D, Hauw JJ, Alperovitch A. Réseau d'études des encéphalopathies spongiformes humaines: premiers résultats. Rev Neurol 1994;150:684-688. Brown P, Cathala F, Castaigne P, Gajdusek DC. Creutzfeldt-Jakob disease: clinical analysis of a consecutive series of 230 neuropathologically verified cases. Ann Neurol 1986;20:597-602. Purvin V, Bonnin J, Goodman J. Palinopsia as a presenting manifestation of Creutzfeldt-Jakob disease. 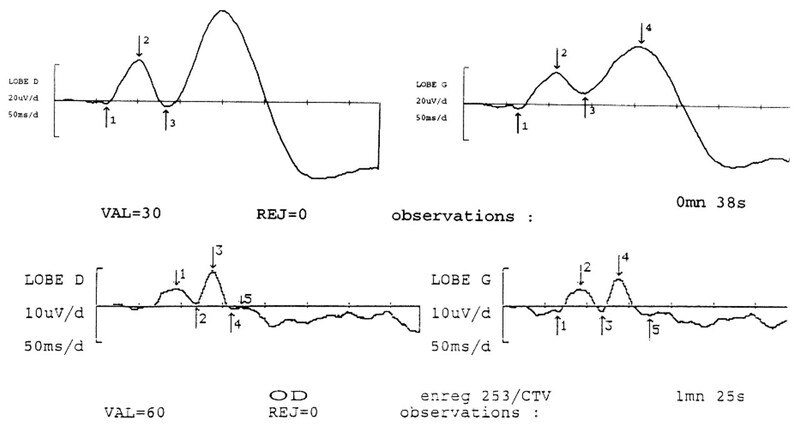 J Clin Neuro-Ophthalmol 1989;9:242-246. Vargas ME, Kupersmith MJ, Savino PJ, Petito F, Frohman LP, Warren FA. Homonymous field defect as the first manifestation of Creutzfeldt-Jakob disease. Am J Ophthalmol 1995;119:497-504. Yokota T, Tsuchiya K, Yamane M, Harashi M, Tanabe H, Tsukagoshi H. Geotopic ocular deviation with skew and absence of saccade in Creutzfeldt-Jakob disease. J Neurol Sci 1991;106:175-178. Richard P, Renault F, Ostre C, Auzoux-Cheve M. Neurophysiological follow-up in two children with Creutzfeldt-Jakob disease after human growth hormone treatment. 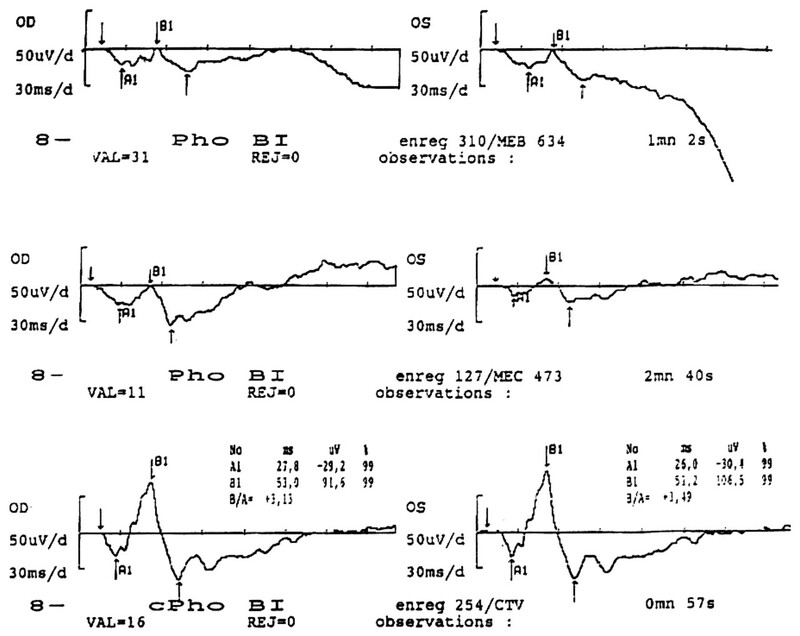 Electroencephalogr Clin Neurophysiol 1994;91:100-107. Forster JD, Fraser H, Bruce ME. Retinopathy in mice with experimental scrapie. Neuropathol Appl Neurobiol 1986;12:185-196. Curtis R, Fraser H, Forster JD, Scott JR. The correlation of electroretinographic and histopathological findings in the eyes of mice infected with the 79A strain of scrapie. Neuropathol Appl Neurobiol 1989;15:75-89. Tsutsui J, Kawashima S, Kajikawa I, Shirabe T, Terao A. Electrophysiological and pathological studies on Creutzfeldt-Jakob disease with retinal involvement. Doc Ophthalmol 1986;63:13-26. Lesser RL, Albert DM, Bobowick AR, O'Brien FH. Creutzfeldt-Jakob disease and optic atrophy. Am J Ophthalmol 1979;87:317-321. Aguglia U, Farnarier G, Regis H, Oliveri RL, Quattrone A. Sensory evoked potentials in Creutzfeldt-Jakob disease. Eur Neurol 1990;30:157-161. Shibasaki H, Yamashita Y, Neshige R, Tobimatsu S, Fukui R. Pathogenesis of giant somatosensory evoked potentials in progressive myoclonic epilepsy. Brain 1985;108:225-240. Fukui R, Tobimatsu S, Kato M. Periodic synchronous discharges and visual evoked potentials in Creutzfeldt-Jakob disease: PSD-triggered flash VEPs. Electroencephalogr Clin Neurophysiol 1994;90:433-437.